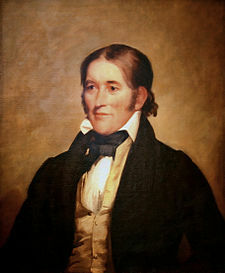 CROCKETT, David, (father of John Wesley Crockett), a Representative from Tennessee; born at the confluence of Limestone Creek and Nolichuckey River in the State of Franklin, present day Greene County, Tennessee, August 17, 1786; attended the common schools; served in Creek campaign, 1813-1814; member of the Tennessee state house of representatives, 1821-1823; unsuccessful candidate for election to the Nineteenth Congress in 1825; elected as a Jacksonian to the Twentieth Congress; elected as an Anti-Jacksonian to the Twenty-first Congress (March 4, 1827-March 3, 1831); unsuccessful candidate for reelection to the Twenty-second Congress in 1830; elected as an Anti-Jacksonian to the Twenty-third Congress (March 4, 1833-March 3, 1835); unsuccessful candidate for reelection to the Twenty-fourth Congress in 1834; fought at the Battle of the Alamo, San Antonio, Tex., 1836; died about March 6, 1836. Bibliography: Crockett, David. A Narrative of the Life of David Crockett of the State of Tennessee. Edited by James A. Shackford and Stanley J. Folmsbee. Knoxville: The University of Tennessee Press, 1973; Shackford, James Atkins. 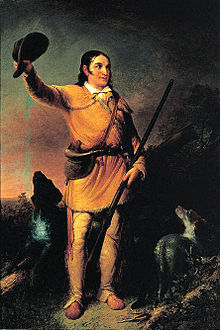 David Crockett: The Man and The Legend. Edited by John B. Shackford; Introduction by Michael A. Lofaro. Lincoln: University of Nebraska Press, 1994.